Are there any Volt owners in Australia? First, reading the forum I noticed something I don't often see, good English and seemingly no foul language, what a pleasure. I'm not a snob or a perfectionist but it's nice to read posts here that don't offend! So, anyway, hi to everyone, sometimes I feel a lonely soul when I drive around Adelaide, why, to date I have not seen another Volt on the road, so I'd like to hear from anyone who currently owns one. I'm very happy to own one and for the first few weeks I spent more time looking at the interior instead of eyes on the road. It also took me that much time to work out what every button or touch button does and how the whole car works. Most cars I can knock off in a few hours, this one had me stumped. So, who out there, no matter what state, has one?? Last edited by BWSS on Fri, 05 Dec 2014, 03:18, edited 1 time in total. I was looking for a second hand one to gauge prices but it appears that anyone who bought one isn't selling it just yet. I ended up buying an ex taxi Prius from the Qld gold coast, just waiting for the car transport mob to deliver it. Hi Rob and welcome to the forum. Edit: How embarrassing - this is where you posted. Oh well you can see that marty11 and g4qber have/had Volts. Last edited by Johny on Fri, 05 Dec 2014, 04:14, edited 1 time in total. Hi Johny, welcome to the real world were we engage our mouth/fingers first before reading, glad to know I'm not the only one!! I'm told there were 101 Volts sold to date but that was from GM, perhaps most are still at dealerships. I looked at all the EV's and all have good and bad points but felt the Volt was the way to go and I would do it again - it just seems to have the right balance to it and it's a very good looking car, no matter were I go or park it I get lots of people looking and admiring it. Last edited by BWSS on Fri, 05 Dec 2014, 04:29, edited 1 time in total. I have a Volt, and will probably be in Adelaide with it around the 8th January next year. Have been in Adelaide (around the city mainly) three times this year. Even had a service at Metro Holden! So if you want to hook up , when I am in Adelaide, will be glad to. I also get quite a few people ask about the Volt, and a surprising number of younger people want to know about it, like uni students , and high school students, and I even had a policeman pull me up in Victoria to have a look, said he had not seen one before.. so I let him take it for a drive! Great to hear from you. I have a computer software shop called the Berlin Wall Software Supermarket, 42 Halifax Street Adelaide so when your in Adelaide feel free to drop in and say hi, that way I get to see my third Volt. Mine, the black one for sale at Hamilton Holden and then yours!! I get so many stopping to look at my car and want to know all about it, one feels like a celebrity, it is an unusual car as you know, extremely pristine. I have owned many cars in my lifetime from Stags to Porsche to Japanese and Australian cars, I loved them all and given the choice I would pick the Volt. I won't rattle one more as I'm sure you know the feeling. I do have a quick question though, does your Volt lock it's doors automatically when you leave the park position? I ask because mine did and one day it stopped working and I had to use the lock button on the dash, and it was hard to convince my dealership it used to work, considering their black one did not do so either, long story short, persistence pays, GM got involved and organised for a software download and now it works - that has been my only complaint, if you can call that a complaint. I havent noticed mine lock the doors at all.. I just put it in Park, stop the engine, get out and press the fob to lock it. I know where Halifax Street is, so I might pop in and say Hi ! 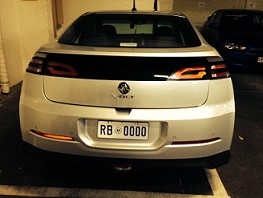 by the way , I think there is another Volt in Adelaide. Here is a link for you! You may be able to pm him / or her.. I was thinking of asking for anyone who owns any electric car to say what most impressed them in a 'goodie' they have in their car. Mine would have been, programmed to my liking via the menu, I stop the car and hit the blue button, alight and walk away, listen for the horn beep and I know all of my car is locked tight, boot included..............sooooo nice..........my colleague at my building has a beautiful Lexus 350 SUV and with all it's goodies cannot do what my volt does, he has to press a button on the key fob, he loves my volt for that feature. The Volt has so many things you can programme it to do, I'm just a sucker for that!! Thanks for the link, I'll chase it up. (up in Brisbane at the moment .. then Byron Bay, coffs Harbour , Central Coast etc.. ) visiting friends - Can't do that in a Leaf can you? Last edited by g4qber on Sat, 06 Dec 2014, 20:55, edited 1 time in total. I'm not sure were the below post went you sent but I'm wondering why the barrage of anti-Volt came from, no EV is perfect, not even the Tesla but we buy or modify what we think is best for ourselves and our families, I chose the Volt for heaps of reasons, all positive. Can't drive more than 90 kms in full electric can you ? LOL I just did a Kurt. ie deleting posts with a "." I just wish that holden would fix the issue. And have been frustrated with Holden's response. Seems that it all could be related to the earth issue. Marty11 can you help me with somehow getting Holden to address the earth fault? I probably need a consumer law lawyer or perhaps I could go to the ombudsman. I'm thinking of keeping the volt long enough just to get it fixed. Paul Davies (Melville Holden) has removed the rubber air dam. His personal car is a Ferrari which is not much larger than the Volt. But he believes in the Volt so much that it is his company car. Melville Holden and Shacks Holden will the only 2 dealerships in WA who can service the Volt. He also says that the Spark EV is coming to Aus. I've found that the i3 seats are as uncomfortable as the imiev for long trips. The volt's leather seats are nice for long country trips. Funny how I consider the imiev to be a sports car. Rear wheel drive and only now realising that sports cars have firm seating. I guess that most track races aren't that long. Seems that there is a high def cam hardware upgrade for the volt. Mountain mode disabled in aus, this would allow charging of the battery like the outlander PHEV. Onstar communications also not available in Aus. Perhaps they could take a LEAF from the Nissan LEAF and BMW i3. Carwings for LEAF and BMW Connected Drive. Even the Outlander PHEV can be controlled via mobile device. Last edited by g4qber on Sun, 07 Dec 2014, 02:49, edited 1 time in total. Will be interesting to see if my posts on here have caused Holden Volts NOT to sell. Might have a law suit from Holden soon for defamation. Last edited by g4qber on Sun, 07 Dec 2014, 02:41, edited 1 time in total. I have read the reviews on the new BMW i3 and it's certainly an impressive car, reading the comments was interesting, as below and one brave guy is set to purchase the car, in the states, who has had a Volt for 3 years on lease and now ready to move on a new car. When one reads the below reviews I just wonder how BMW will fix this almighty blunder? Before my two Harley's I did have a top end BMW motor bike and it was a great bike, expensive but great. I always get the impression with BMW that not only are they expensive to purchase but you have to pay so much more again for almost basic things in a car, not just the i3 but the whole range. Last edited by g4qber on Mon, 08 Dec 2014, 11:27, edited 1 time in total. Briefly one is high def security cameras mounted back and front, they work perfectly, the second is my idea on how to fix the gap between the rear seats and give a margin of safety with contents. I hope you enjoy my ideas. Last edited by BWSS on Tue, 09 Dec 2014, 05:48, edited 1 time in total. I'm keeping my volt for now. it allegedly does 169kmh and comes up with "speed limited to 169kmh" message. especially useful when falling asleep on long distances. I hope that Holden/GM will eventually fix the earth leakage issue. How many volt owners have removed theirs? I was using a hat/cap to cover the chrome reflection yesterday on the 44.4 deg day. Last edited by g4qber on Tue, 06 Jan 2015, 14:14, edited 1 time in total.